Do you know what one of the most wonderful aspects of homeschooling is? Being able to learn at the pace of your child. It’s so wonderful to be able to accelerate learning and watch your child thrive. But sometimes your child is not doing well. You child is struggling and falling behind. Consider a do-over. Yes, I’m giving you permission to start over. 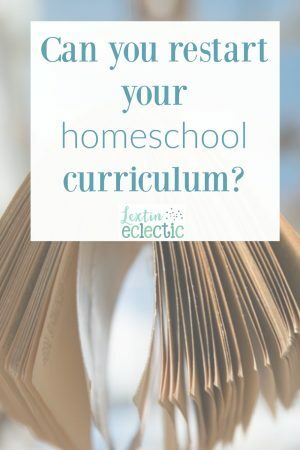 One of the most important decisions I’ve made for our homeschool journey was to start over on some of our curriculum. My oldest child was not doing well in math during her Kindergarten year. We pressed forward into 1st grade and I was hopeful she would soon start understanding the concepts. Many tears later, I realized that our current plan would not work. I switched to a new curriculum and started at the beginning level of that curriculum. This meant that we were starting a Kindergarten math program in the middle of our 1st grade year. I felt completely panicked that my child would be perpetually behind in math but I felt I had no other alternatives as she was making zero progress. Well, we completed that program and then spent over a year on the next level of that program. If you’re doing the math, you’ll now see that we were two years “behind.” I continued to stress and panic. Once we began the 3rd level of that program, something clicked for my daughter and she breezed through the next 3 levels. She’s now slightly accelerated in her math program. Yes, we went from extremely “behind” to slightly ahead. I’m so thankful for Right Start Math which teaches my kids to understand the math concepts and gives them an amazing math foundation. My son has never been very excited about learning to read. He found it challenging to master the alphabet and to learn the different phonogram sounds. Reading has been a struggle from day one. We spent over a year on the 1st level of our reading program. I wasn’t sure we would ever finish it. Then we made it halfway through the 2nd level and I decided that we should probably start over. He was getting extremely frustrated and discouraged and I felt he had not mastered the material. So, we went back to the beginning. He made very, very slow progress and we worked our way through the 3rd level. I felt that reading was still a huge challenge for him, so I asked him if he’d like to move on to the next level or if he’d like to go through that entire level again. I was shocked when he said he wanted to review the entire 3rd level of that program. Now that we’re working through Level 3 for the 2nd time, I have seen his reading ability start to improve more rapidly. I had suspected that he was not initially ready to keep moving forward, but I’m proud of him for recognizing that he needed more time. If you’re wondering about our amazing reading curriculum you can get more information about it on the All About Learning website! And definitely grab their free reading activities too! I’ve allowed us a do-over on multiple occasions. Making the decision to start a curriculum from the beginning for the 2nd time can be stressful. You might feel behind or that you’ve completely failed. And when you feel that way, I’d encourage you to remember your ultimate goal – you want your child to learn the material and be able to master the material. Completing a workbook or curriculum is not success – truly learning the material is success. When you feel your child has stopped making forward progress, you might need to sit down and evaluate. Ask yourself if the child truly understands the material. Go back 5 or 10 lessons and do a review to see if the child can complete those lessons without much help or prompting from you. If you find that the child is struggling in multiple lessons, it might be time to consider a do-over. Don’t let yourself feel like a failure. Your child is not abnormal. I’ve found that learning isn’t linear. Children can make huge forward progress only to seem to regress twice as quickly the next year. Taking the time to do a thorough review might be just what a child needs to master the material. You might find that after taking time to start over, your child makes forward progress 3 times as fast. So, listen to your child. Follow his or her cues. Work at a pace that allows for mastery. I have never regretted the times that I started over in our curriculum. And, if you suspect any significant learning challenges, find someone to evaluate your child so you can find the appropriate help and support. Are you sure you’re expectations are age appropriate for your children? Learn more about developing age appropriate expectations. And just know that learning can be messy – it’s definitely non-linear! Also, in case you ever doubted it, know that homeschooling is a full time job! But keep up the great work!